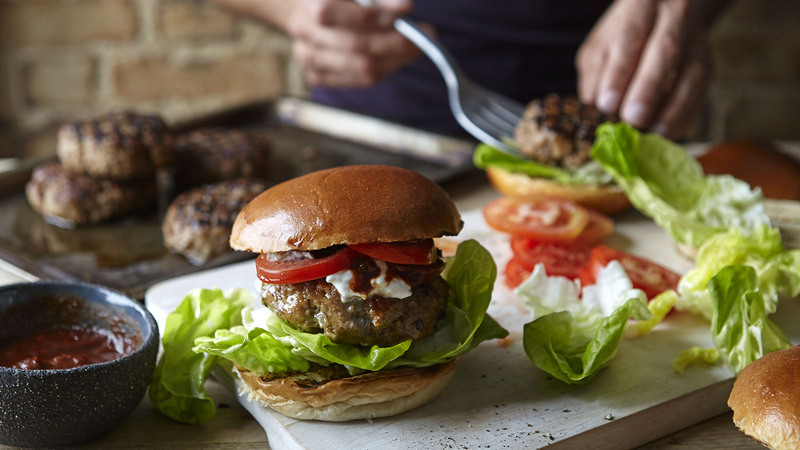 Get barbecue-ready with these delicious lamb burgers from Joe Wicks. Preheat your oven to 180ºC (fan 160℃/gas mark 4). Fire up the barbecue or preheat the griddle pan. Chuck the potatoes into a roasting dish, pour over the oil, sprinkle on the paprika and season with salt and pepper. Toss the whole lot together so the potatoes are evenly slicked in the oil, then slide into the oven and roast for 45 minutes, turning a couple of times during the cooking process. Melt the coconut oil in a frying pan over a medium to high heat. When it is hot, add the onion and cook for 2 minutes, stirring regularly. Next, add the garlic to the pan and continue to fry for 1 more minute. Tip the mixture onto a plate and leave to cool a little. Grate the cucumber and place it into a sieve. Sprinkle over ½ teaspoon of salt, mix well and leave the cucumber to sit and drain while you carry on with the rest of the recipe. Plonk the mince into a large bowl and add the 2 teaspoons of ground cumin, breadcrumbs and egg along with some salt and pepper. Scrape in the onion and garlic and then use your hands to mix the whole lot together. With slightly damp hands, shape the meat into six roughly equal-sized burgers. Cook the burgers on the barbecue or a griddle pan for about 4 minutes on each side, then remove from the heat and leave to rest for a couple of minutes. Give the draining cucumbers a squeeze, then tip them into a bowl with the yoghurt, season with salt and pepper and the final pinch of ground cumin, and mix well with a spoon. Build your burger however you like. I prefer to spread the bun with chipotle paste, whack on the burger, top with tomatoes and lettuce, dollop with the cucumber yoghurt and serve with the paprika spuds. Bestselling author Joe Wicks, aka The Body Coach, presents this gorgeous book featuring more than 100 delicious and nutritious recipes that are perfect for sharing with the special people in your life.